Preheat the oven to moderate 180C. Grease a 32 x 24 cm, 6cm deep, ovenproof dish. Heat 1 tablespoon of the oil in a small saucepan and cook the leek and garlic over medium heat for 10 minutes, stirring occasionally, until soft and lightly golden. Transfer to a large bowl and allow to cool. Meanwhile cook the pumpkin in boiling water for 5 minutes, or until just tender. Drain well and cool. Add this to the bowl with sweet corn, pumpkin, cheese, rosemary and parsley, season generously and mix gently thoroughly. Place the filo pastry on a clean workbench and cover with a damp tea towel to prevent the pastry drying out. 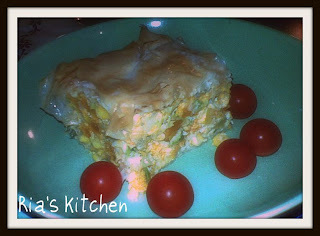 Lightly brush one sheet of filo with oil and place in the dish. Layer five more sheets in the dish, brushing all but the last sheet with oil. Gently stirr the eggs into the pumpkin mixture, then spoon into the dish. 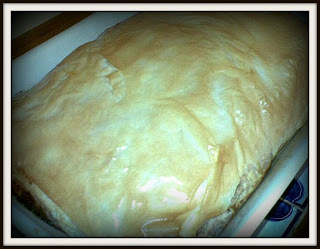 cover with the remaining filo pastry, again brushing each layer with oil, and tuck in the edges. Bake for 1 hour, or until the pastry is golden brown and the filling has set. Serve immediately with fresh salad or cherry tomatoes. note: you can also replace the can sweet corn with 3 corn cobs, cook them in saucepan of boiling water until tender. Drain, leave until cool enough to handle then cut away the kernels. 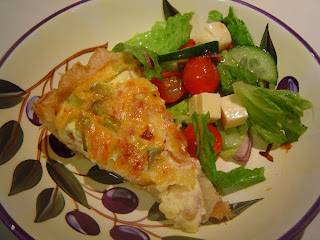 I make this quiche tonight serve with fresh salad. It’s good for summer time too when the weather is hot and you feel something light and fresh. It’s easy to make and healthy. I use bacon but you can omit it. Roll out pastry and line quiche pan or line pan with filo pastry. Brush or spray filo pastri lightly with oil between layers. 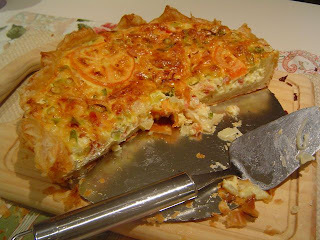 Combine the spring onions, onion, milk, eggs and pepper (and bacon if you use it) and pour into pastry base. Place tomato slices on top and voer with grated cheese. Bake 10 minutes at 200 degree celcius then reduce temperature to 160 celcius and bake until set. 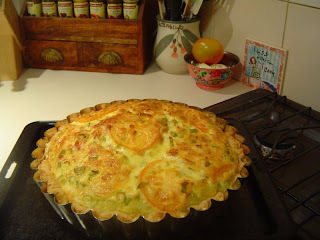 Use full cream milk not skim milk, it’s a must or the quiche will not set firm. For a richer quiche, replace 1/2 the milk with cream.